We've been doing yard work for three days. And when I say "we", I mean mostly Ed, but I have actually been out there helping. You can ask him yourself. Our plan is to remove some of the dead branches and prune the unsightly bushes, then we want to add some decorative rock, several golden barrel cacti, a new pathway to the front door (the old one has been washed away over the years), and maybe even add some colorful flowers to offset the greens and browns of the desert. The weather is still cool in the mornings - we've been starting about thirty minutes after sunrise - and I've decided my helping in the yard means I don't have to go for my one-mile walk. I'm counting this as my daily exercise. I have been using loppers to cut branches off trees and reducing the size of small bushes. 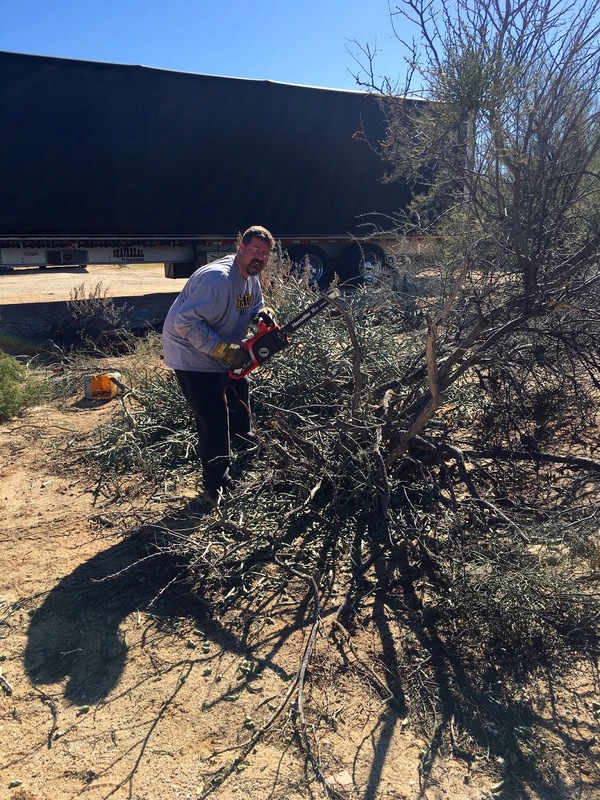 Then I collect the piles of branches and bring them to the dump trailer. I carry my iPhone because I have an app that counts my steps and logs my activity. There's a lot of walking back and forth with this kind of work and if my app is correct yard work burns WAY more calories than walking around the block. And I rake, which isn't as easy as it sounds. Using the fan rake isn't bad because it gently glides over the little pieces collecting them in a nice neat areas. The bow rake is a little more challenging because it moves bigger clumps of stuff and I've noticed my upper body strength waning when I use it. I also can't quite master shoveling. You'd think that would be easy, right? Well, it's not for me. 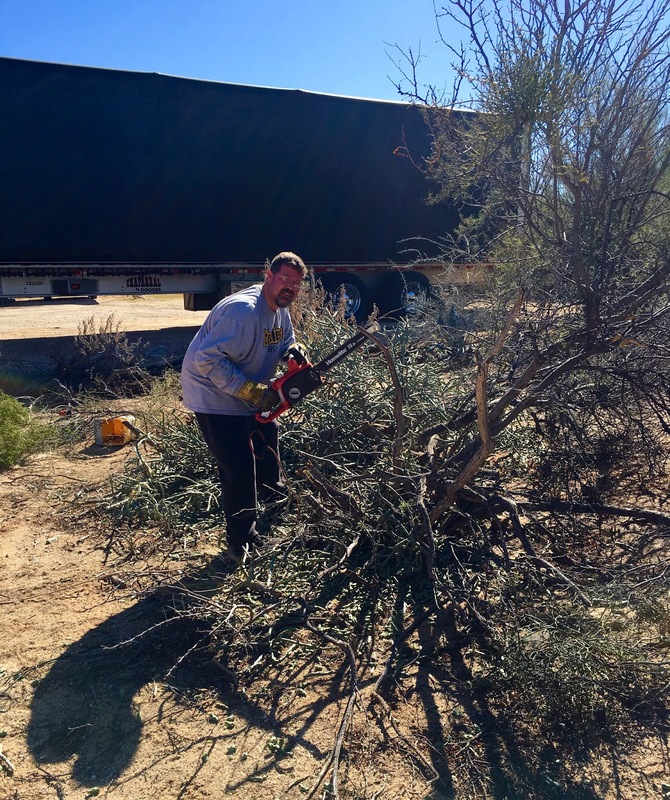 Raising a shovel laden with cactus nibs above my shoulders to pitch it into the trailer isn't something I can get the hang of yet, mostly because the cactus pieces fly back in my direction which isn't ideal. Today I put in three hours outside, one of them leaning on the shovel and riding in the cab of the truck as Ed and my brother used it to pull stumps from the ground, and then I took a ride to the dump with the boys. And I've finally found a use for the 700 pairs of free gloves I've collected.